The great artwork of Valenzuela, is sometimes overwhelming, and others, dreamlike and lyrical. But always awesome. It has an extensive range of sober, velvety and strong colors. Fantasy and grandeur define his themes, which are often magnificent forests and rich glazes. He delights us with his amazing drawing and color at all times. We can say his pieces of art are painting for connoisseurs; some really astounding paintings that fascinates by themselves. Camilo invents a new form of dreamlike expressionism ; It is, however, elusive lyrical and, at the same time represents the denial of a world that is sometimes too inhospitable for sensitive people. Don´t think Camilo Valenzuela is now trying to reinvent art or dazzle anyone with childish originalities. In his painting, as great master DOrs had wished , the author follows a style that while romantic and exalted can be also considered as traditional and honest, interpreting this as the continuation of beauty and art canons . We are alluding to the same styles that our religious painters used to delve into the mysterious worlds of mysticism and martyrdom, such as the tragic dreams of Goya in his black paintings and Solana in his dramatic rustic masquerades. Valenzuela has a visual language rich in qualities and evocative chromaticisms at all times and circumstances, very fitting for each one of their unique creations. But in his works he goes beyond that. In them, we find an amazing world, dreamed or intuited by the tremendous sensitivity of the painter, who is forced to paint to meet his strange and compelling need. What matters about this man and his name, is his ability to communicate with some mysterious fluids, shadows, fumes, silences, eagerness, stalkings; underwater and forest landscapes contemplated by a pair of night pupils, chaos in a germinal or prophetic state. Valenzuela paints because of an irresistible need. He obeys to a stronger mandate than that of his own blood, tradition or circunstances. He has devoted himself to painting. And because of that, painting flows from his fingers as a source or unstanchable lymph. In short, the first astonished at his plastic action are us. It is he. Camilo Valenzuela. He is the medium-painter. He is the priest, or rather the sorcerer of the tribe. Valenzuela´s painting is a flow of cadences that are close to the last teasers and harmonies of existence, through a hidden esterometría, in which the highest value is granted to the spiritual structure, which has to remain untouched. So the artist creates fascinating, surreal, purified worlds, which retain references to the existing world, outside of which we cannot jump to the free spaces of the clean spirit. Valenzuela´s artworks are not of a commercial kind. 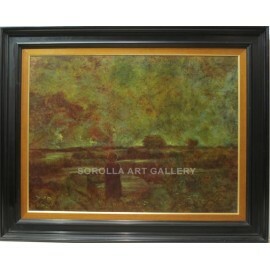 They are works for connoisseurs, collectors and art enthusiasts. We can describe Valenzuelas work as suggestive, awesome, hurtful and hard sometimes, as well as mysterious, lyrical, dreamy, subtle, but noticeable and intellectual, available at various levels, sometimes narrative, stylish, spiritual and stylized. Decorative and sober at the same time, varied and complementary, but always breathtaking. (From the thesis written by Cristina Dominguez entitled The Expressionist alternative of Camilo Valenzuela).